It's a long trip from Newark, NJ to Manado the capital of Northwest Sulawesi in Indonesia. Leaving at 11am on a Thursday morning, I finally arrive at 1pm on Saturday afternoon with a couple of layovers in Tokyo and Singapore. All told, it's roughly 32 hours of travel not taking into account the 3 hour drive to Newark and the 2 hour drive plus boat ride from Manado to Lembeh Resort. I have finally made it and the resort looks amazing! The rooms are villas nestled in amongst the jungle hilltop, a large open dining room is where guests come for meals (which are all inclusive) and the swimming pool sits invitingly close to the waterfront where the house reef entices us with opportunities to see mandarin fish, blue ringed octopuses and other bizarre creatures. I'm most excited about the large camera room with plenty of space for everyones camera gear as well as electric outlets for charging batteries. I'm here on an underwater photography workshop where we'll spend 10 days looking for and photographing the weird and wonderful critters that Lembeh Strait is famous for. Unlike diving on coral reefs, the majority of the diving in Lembeh Strait is on black volcanic sand. It's called muck, but don't let that name discourage you. The black sand is host to some of the craziest creatures on the planet. A typical dive briefing goes something like this: "We'll drop in at about 60 feet, and then zig zag our way up the black sandy slope looking for critters." Sometimes we dive deeper to find certain critters such as the fire urchins that host coleman shrimp that like to hang around 100 feet. Other times, we might dive very shallow, looking for the beautiful harlequin shrimp. A pair of coleman shrimp (Periclimenes colemani) hosted on a fire urchin. Each day, a whiteboard in the changing area identifies divers names next to the boat, guide and dive sites they'll be going to. The dive boats are roomy with a solid roof to protect you from the sun. Getting in and out of the dive boats is very easy and most of the dive sites are just a short ride from the resort. Once on the boat, divers are split into groups of roughly 4 people and a dive guide. In Lembeh, you want to stick to your dive guide like glue. They have the ability to spot critters you just won't find on your own. You're welcome to go venture out by yourself, but trust me, you will want to leverage the amazing spotting abilities of your guide. The guides all have slates and let you know what you are looking at. While you're checking out one critter (or photographing it), the guide leaves to find the next subject so that you are rarely waiting to see something new. The dive guides all carry a stick with them known as a "Lembeh" or "muck" stick. The stick is used for pointing at the critters so that you can see them. Many times the critters are so well camouflaged that at first you will have a hard time figuring out what the dive guide is pointing at. "Why is he showing me a leaf?" Later you realize that its a robust ghost pipefish and there were two of them! Sometimes the critters are so small you have to use a magnifying glass or your cameras viewfinder to see them. 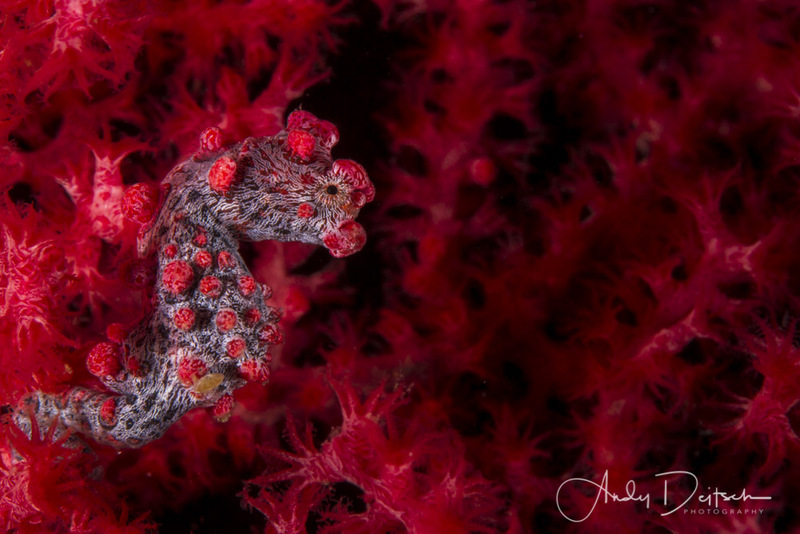 Case in point is the pygmy seahorse which lives its entire life on a gorgonian sea fan. Pygmy Seahorse (Hippocampus bargibanti). Approximately 3/4" in length and very well camouflaged. In July, 2018 Adirondack Scuba has a dive trip to Northwest Sulawasi where we'll spend 6 days in Lembeh Resort and 5 days in a sister resort called Murex Bangka. Whether you are a budding underwater photographer or are just interested in seeing some amazing creatures that you won't find anywhere else in the world, come and join us for an amazing trip. More details on the trip can be found here. 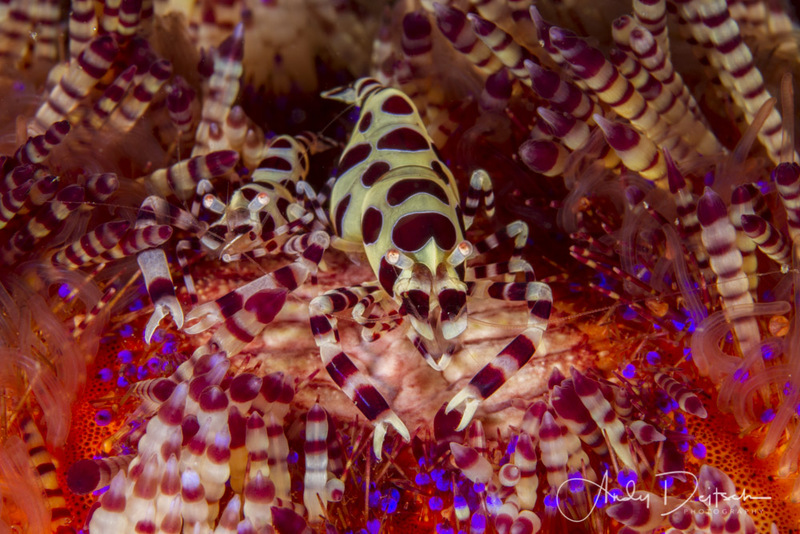 Below are a selection of photos I took on my last trip to Lembeh in 2013. I hope you can join us in 2018!